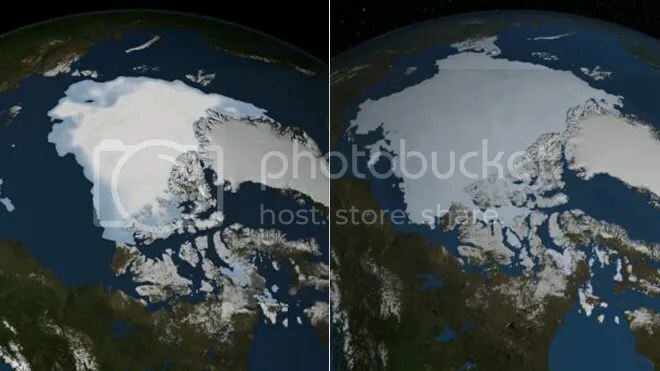 Remember when the Arctic was gonna be ice free soon due to Global Warming? Yeah…about that. Never mind. L to R: Arctic sea ice coverage 2012, 2013. In case yer a GW fanboi, the right pic is what’s known as “more” and not “less”. If, like me, you were trolling around on the internet within the past 4-5 years you likely ran into an article or forum conversation regarding global warming. Remember those days? The world was heating up so drastically that within 30 years the Great Plains would be a desert, Venice would be under 10 feet of water and the Arctic would be a summer paradise? Droughts, floods, famines, wars, environmental apocalypse was virtually at the door and that we needed to ACT NOW TO SAVE THE PLANET! Remember all that stuff? Remember how, if you didn’t simply automatically swallow the “hundreds of peer reviewed scientific studies” that proved Global Warming (or “GW” at the time for the in-crowd cool kids) was a thing and that it was undoubtedly linked to increased CO2 emissions by modern human civilization, that you were a global warming denier, didn’t believe in science, was likely some kind of fundamentalist anti-science wingnut? Remember the “good old days” of being a tree hugging concerned leftist and how absolutely sure you were that anyone who opposed your views on this subject were simply evil, degenerate idiots who lacked the smarts to agree with your views because…”science”? I hope you remember those days because, well, they’re kind of gone…again. It all started just a few years ago with actual skeptical people (which apparently didn’t include a whole lot of scientists unfortunately) observing that, hey, it hasn’t gotten warmer where I am. Those folks were told (you evil, degenerate idiot you) that local conditions vary but, by the-God-we-don’t-believe-exists-but-whose-name-makes-swearing-a-lot-easier, Global Warming Climate Change (the new and improved accepted term because evil, degenerate idiots kept pointing out all the “warming” holes in the theory) was real because SCIENCE (and you’re a stupidhead if you don’t automatically agree). Then someone who also wasn’t as smart as all the patchouli smelling hipster kids pointed out that the temperatures on Mars was also rising. Naturally, he too was shouted down as a troglodytic Luddite (even though he was a scientist) because “[h]is views are completely at odds with the mainstream scientific opinion,’said Colin Wilson, a planetary physicist at England’s Oxford University” (because it’s not actual science that determines fact but the consensus of a group of people). I mean, sure, human produced CO2 emissions MUST be the cause of rising global temperatures (even though there are pretty much zero people on Mars…since Gary Sinise left in the alien spaceship anyway) and definitely NOT because the Sun (the giant ball thermonuclear fire that burns at around 27 million degrees at its core) was in a more active than usual cycle (remember kids: CO2 > enormous ball of nuclear fire next door…when it comes to what makes the planet hotter). And surely you remember being the fool who was chided for looking smug when the whole “Climategate” scandal broke. You know…that event where hackers got hold of thousands of emails from scientists who were convinced that GW/Climate Change was occurring as a result of human activity and that, unless we radically changed our entire society (pretty much just western society which actually contributes the minority of the CO2 but hey…don’t get stuck on facts NOW) we were all GOING TO DIE? Yeah, you recall that. Remember how prior to that scandal one of the issues skeptical people had with this whole cabal of scientists shrieking from the rooftops of all the ivory towers how this was all going to be one enormous environmental disaster was that they wouldn’t grant access to the data they were collecting, wouldn’t honor freedom of information requests so skeptics could truly look at the raw information to see if these dire predictions were true and how the scandal exposed emails wherein the scientists were worried about how to spin observations that showed their “climate models” that were all apparently forecasting global annihilation weren’t jiving when they should be…and that those findings should simply be ignored or maybe put through a algorithm that would churn out “acceptable” data that would jive better with their models? Remember how if you pointed at that and said that such activities aren’t those of people on the up and up and that perhaps a less biased, less fueled-by-millions-of-research-dollars studies MIGHT be a better idea…that you were once more pilloried for being a backwards, delusional fool? Pictured above: someone who rational, level-headed people probably wouldn’t trust with a forecast of the future OR the latest demiGod to those on the left who seem to exist solely for the purpose of wringing their hands over the latest manufactured crisis-du-jour. Either or. Anyway, remember all those good old days of…just 3 years ago? 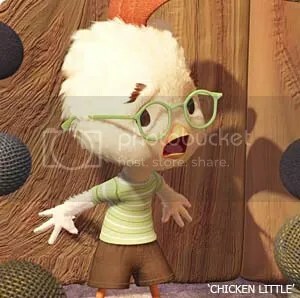 Yeah, well, turns out, if you were thinking with your own brain and thought that taking the word of a bunch of leftist organizations who seemed a whole lot more interested in how to leverage the scare about Global Warming into a socialist wealth redistribution scheme via “carbon offset credits” wasn’t a sound basis to frantically be doing the scientific community version of Chicken Little…step up to claim your prize. Turns out that an early report leaked from the IPCC (the U.N.’s Intergovernmental Panel on Climate Change) is trying to figure out how to spin revelations that all those peer reviewed studies who were all in lockstep uniformity just 20 years ago that predicted global temperatures would rise by 0.2C (a big number on a global scale)…had only risen 1/4 of that (0.05C). Yeah, it seems that of those 117 studies who all uniformly foretold climate doom back in the 1990’s…that were the backbone of the entire Global Warming/Climate Change crowd…only 3 were even remotely close and 114 (that’d be a whopping 97.4%) weren’t just wrong but, on average, overestimated the amount of global warming that actually ended up happening by more than 200%. What does this have to do with wisdom though? Only this: wise people realize that a new field of study that suddenly gains enormous prominence, the attention of the entire globe and sees hundreds of millions of research dollars being handed out to anyone willing to conduct a global warming study MIGHT be susceptible to influence, bias and corruption because (get this): scientists are people too. People are subject to the same weaknesses and sins and scientists are no exception and scientists AREN’T machines incapable of mistakes or outright lying…they’re people just like you and me. Does this settle the idiocy of the ever panicking leftist crowd vis-a-vis Global Warming/Climate Change/the Sky Is Falling? Of course not. You’d have to believe that facts and subjective thought have any effect on such thinking and, subjective observation long ago ruled out that theory. What it does do though is to re-affirm that cooler heads (not an intended pun but an apt one nonetheless) are called for and, in this instance (as in most others), those who say “stay the course, let’s see if this is real or not” turned out, yet again, to be right. Let’s be entirely clear here for a moment: the globe DID get warmer. There seems to be a lot less proof now that CO2 or other greenhouse gasses are to blame for the rise than was previously thought but the fact still remains that we did get warmer. Also, regardless of whether there is a human origin for such a rise it’s still a good idea to move our economies away from a fossil fuel basis for energy supply (and towards cleaner, renewable sources). This is simply a good idea even minus the typical hysterical climate reasoning. What skeptics like me have always said is that while we need to move towards those goals, there is no emergency thundering toward us that should stampede us collectively into stupid, half-baked solutions to problems that don’t really exist. And that’s why wisdom, sometimes, is comfortable. This entry was posted on September 17, 2013 at 10:41 am	and is filed under In the news, On the web, Politics, Science, Weather. Tagged: Arctic sea ice, Chicken Little, Climate change, climate change skeptic, Climategate, Global Warming, IPCC. You can follow any responses to this entry through the RSS 2.0 feed. You can leave a response, or trackback from your own site.